Still a hint of black (I can't give it up completely!) and still mostly blue (but not navy! ), but I've also brought in some purple to the palette. 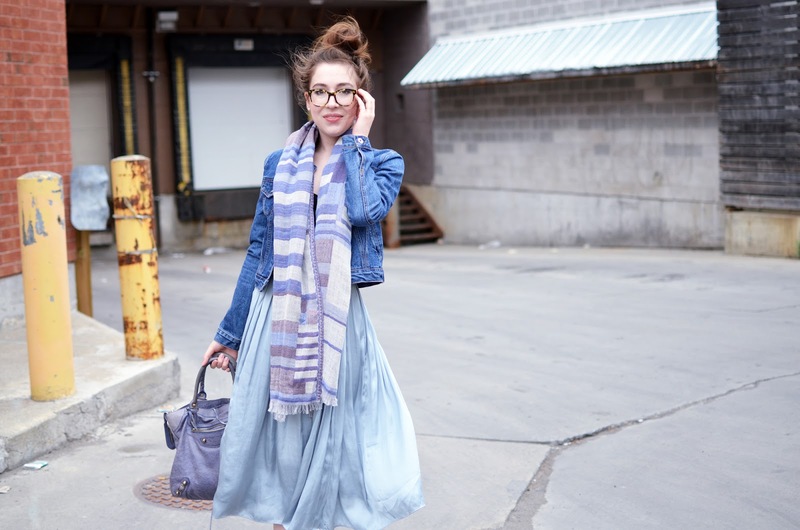 This scarf is pretty new, from Aritzia. Please, please, try to contain your shock and disbelief that I bought something there... *not*. After essentially marrying my blue and burgundy blanket scarf all winter, I decided I needed a summer alternative that would not cause me to melt into a puddle, because surprise, wool scarves are hot. Enter this beauty, made of mostly cotton, and still a bit of wool, because clearly I cannot fully let go just yet. It's also the season for my Balenciaga Velo. I had put it away for the winter due to its colour and my paranoia that it would not survive the weather, and it is now ready to make its grand re-entrance. I'm actually thinking of sending it away to have it re-dyed back to its original Jacynthe colour. Whoever owned it previously was not very kind to it. I'm still trying to figure out the logistics of doing that, but I think it will be in my summer/fall plans (but let's not talk about fall just yet!). Are you happy to see me embracing more colour? I kind of like it on occasion, but don't get too used to it - I'm a neutrals girl at heart!